Zephaniah 3:14-20 — The alienated ones are gathered with rejoicing. Luke 3:7-18 — Whose values are we agreeing with? Philippians 4:4-7 — Anxiety stalks, but praise and thanksgiving overcomes. SUMMARY The Lord is taking delight in His faithful people, gathering them and bringing them home. John foretells that One greater than him will baptise with the Holy Spirit and with fire, warning people to get right with God. Paul reminds his churches, don’t be anxious but rejoice, for the Lord is near! 14-15 Sing, Daughter Zion; shout aloud, Israel! Be glad and rejoice with all your heart, Daughter Jerusalem! The Lord has taken away your punishment, He has turned back your enemy. “Be glad and rejoice” — a complete reversal of the pronouncement of woe and wrath earlier in the chapter, after which a remnant arises again to find God’s favour. The Lord, the King of Israel, is with you; never again will you fear any harm. “Taken away your punishment” – stated as if judgment day had already happened. God removes His wrath and lifts the curse of transgression through Christ. For further study, read Romans 5:9, Rom. 8:1, Gal.. 3:13-14. “The Lord, the King of Israel, is with you” – the true king of Israel was always the Lord, Yahweh, and other rulers were to represent Him. The NT uses this title of Jesus the Messiah, John 1:49, Matt. 27:42 and John seems to apply this verse to Jesus at His Triumphal Entry, John 12:13. 16 On that day they will say to Jerusalem, ‘Do not fear, Zion; do not let your hands hang limp. “Hands hang limp” – do not be discouraged. “The Mighty Warrior” – Yahweh is the supreme Commander, Psalm 24:8. “Will… delight in you” – like a bridegroom with his bride, Isaiah 62:4-5, Isaiah 65:18-19. Zephaniah was possibly a disciple of Isaiah who shared something of the same vision. His message is that when God’s people seek Him, Zeph. 3:12-13, and rejoice in Him in a relationship of trust, vv.14-15 above, the Lord is so delighted He bursts forth with celebration and loud singing. 18 I will remove [or gather] from you all who mourn over the loss of your appointed festivals, which is a burden and reproach for you. “All who mourn over the loss” – all translators agree that this is a difficult verse. The context esp. vv.19-20 below suggests this is God’s promise to make things right, by both gathering and removing those who remain rebels to God’s truth, and also gathering and bringing back those driven from Jerusalem by oppressors. 19 At that time I will deal with all who oppressed you. I will rescue the lame; I will gather the exiles. I will give them praise and honour in every land where they have suffered shame. 20 At that time I will gather you; at that time I will bring you home. I will give you honour and praise among all the peoples of the earth when I restore your fortunes [bring back your captives] before your very eyes,’ says the Lord. “I will rescue… gather… give honour and praise” — special favour in an intimate way for those who have held on to faith through the deprivation and shame of exile. IN PRACTICE This week’s theme of ‘Be Prepared’ starts with a passage that is set in the context of God’s wrath. The start of Zephaniah 3 is about Jerusalem, the city of oppressors, and God’s judgment which, as always is intended to be a wake-up call and bring correction, Zeph. 3:1-7. However, following the inevitable punishment, a refining takes place and God delights in those that remain, who have kept faith in Him. In our world, we can see where God’s judgment for ‘doing our own thing’ has resulted in a dramatic fall in church attendance and prosperity. Perhaps it’s needed, so that we wake up and think again about whose church it is, and whether we are in love with God the Father and His Son Jesus, or the traditions we are attached to. The bottom line is that God is good, He loves us and He has a real purpose for all of us – for which some discipline is also a measure of His love. QUESTION What does God want from us as a faith community, that is a tension with what we want? Luke 3:7-18 – Whose values are we agreeing with? “Vipers” — a way of challenging them about having become the seed of the Serpent, Gen. 3:15, in their attitudes and actions. These vipers, Isaiah 59:5 are the rebellious people of God who turned the way of the Lord into crooked roads, Isaiah 59:8. “We have Abraham” – the erroneous and somewhat arrogant belief of some Jews who believed that descent from Abraham was their assurance of salvation, John 8:33-39, Acts 7:2. “The axe… tree… good fruit” – genuine faith produces good fruit. Claiming the ancestry of Abraham was meaningless if not matched with righteous, just and generous-spirited living including a willingness to engage in repentance responding to John’s call. 10 ‘What should we do then?’ the crowd asked. “Two shirts” – a long tunic undergarment. 13 ‘Don’t collect any more than you are required to,’ He told them. “Tax collectors…soldiers” – probably a form of police in the employ of Herod Antipas to protect the tax collectors, a rejected community seen as supporting the Roman oppression. John preaches honesty and concern for those in need, against the fraudulent dealings and extortion that had become part of the accepted way of life. 15-16 The people were waiting expectantly and were all wondering in their hearts if John might possibly be the Messiah. 16 John answered them all, ‘I baptise you with [in] water. But one who is more powerful than I will come, the straps of whose sandals I am not worthy to untie. He will baptise you with [in] the Holy Spirit and fire. “The Holy Spirit and fire” – a holy ‘drenching’ that will transform and purify. Fire is often used in the OT as an illustration of the judgment that purifies, exposing what is insubstantial and ‘combustible’. The Holy Spirit also reveals what is not of God and exposes our self-deceptions in a transformation that can be a fiery and radical purification. 17-18 His winnowing fork is in His hand to clear His threshing-floor and to gather the wheat into His barn, but He will burn up the chaff with unquenchable fire.’ And with many other words John exhorted the people and proclaimed the good news to them. 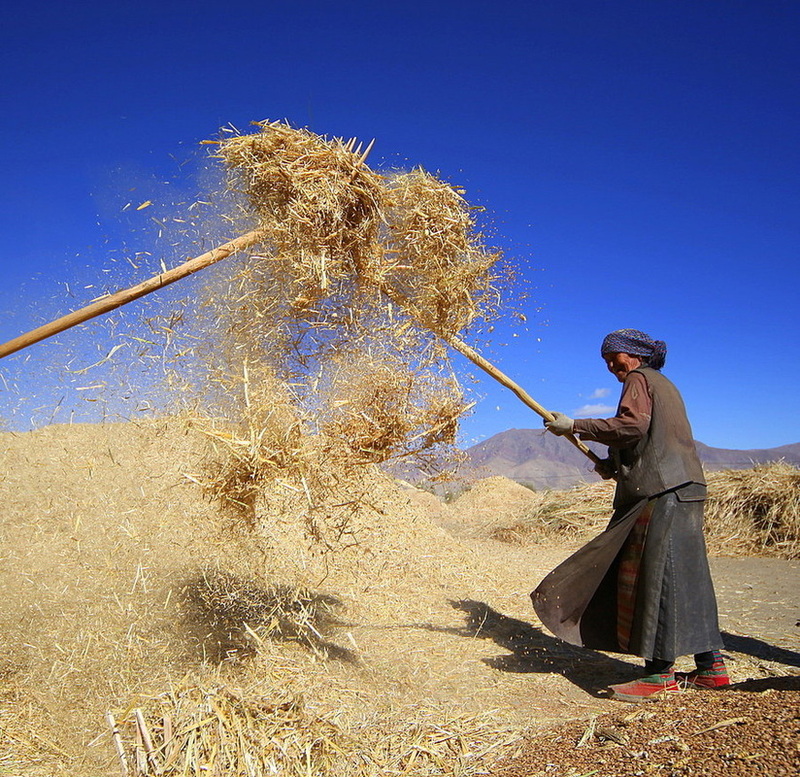 “Wheat… chaff” – the righteous versus the unrepentant. John’s theme throughout is on the need for a humility before God which brings with it a sincere dependence on God and a lifestyle of willingness to recognise and deal with everything in life which is not God’s way. “Winnowing fork” – many Jews had assumed a false sense of entitlement, believing that when the Messiah came, only pagans would be singled out, but John makes clear that judgment and punishment that judgment will come on all who do not repent. “Proclaimed the good news” – John’s message heralded the coming of a Saviour, both imminently and also in the final judgment – a message of joy and justice for all who would receive Him but a stark warning for those who would not, both present and future. IN PRACTICE The Jews were confident that they deserved favour from God because of their heritage, rather conveniently overlooking the swatches of of their Scriptures (Old Testament to us) which speak of rebellion and apostasy and the inevitable consequences which they suffered in exile and then a series of invasions. The hated (but for the most part, just and professional) Roman rule was just the latest of a number of occupations. What about us? We live in a so-called Christian country. We may have served our church or fellowship faithfully, with others looking to us as the ones who ‘keep things going’. But has that given us a false sense of entitlement? This “be prepared” season is a good time to ask if we are holding faithfully, or perhaps just tenaciously, on to what God actually wants us to let go of, so He is able to “do a new thing”, Isaiah 43:18-19. And to be humble enough to let go of any sense of entitlement is definitely a good way to “be prepared”. PRAYER Lord, as I mentally line up for John’s baptism and wonder what in me has more of the hallmark of the snake, rather than the Spirit, help me to let go of attitudes that need to go, and to embrace the change and holiness You are revealing in this season. For Jesus’ sake, Amen. “Rejoice… always” – the back-story here is a disagreement – we might say, a church split – serious enough for the parties to be named in a letter to be read out. The enemy’s strategy is always to find ways to cause disagreement and division, and the God-given remedy is the capacity that Christians have to see beyond themselves, and find agreement. Rejoicing is an attitude of relationship with God, not circumstances, and in that relationship His way becomes clear. 5 Let your gentleness be evident to all. The Lord is near. “Gentleness” – the quality of Christlike consideration, generosity of spirit, especially required of church leaders, 1 Tim. 3:3, Titus 3:2. “Near” – A reminder repeated elsewhere in the NT that the next great event in God’s salvation schedule is Christ’s return. The whole span from Christ’s coming at Bethlehem to the final consummation of the kingdom is “the last time” in which, from God’s perspective, a thousand years are like a day, . “Near” or “at hand” also speaks of the Lord’s nearness in the prayer relationship, the presence of One poised to return. “Do not be anxious” – because the Lord is near. Prayerful thanksgiving in every situation is the antidote to anxiety which makes way for God’s peace. “The peace of God” – the assurance of those who know their sins are forgiven and, receiving God’s love, can trust Him beyond their perspective of circumstances. IN PRACTICE The Lord is gathering those that are really His with rejoicing, not with arguing. However, we have an enemy who is utterly opposed to the love, grace and acceptance that is the heart of the Gospel, and will work on our thoughts wherever our independence from God (the short word is ‘sin’) has given him a way in… and we may not realise where it from until it is too late. Church politics, often linked to religious inflexibility, has resulted in millions that believe in God but don’t believe in His church. If, however, we are characterised as those who “Rejoice always” because we know that God is good even when things are challenging, then that is a very attractive proposition. Anxieties abound in our complex and conflicted world – and everyone is looking for the people who can deal with doubt and fear by prayer and petition, with thanksgiving. A tall order? God has called us, as Christians, to live differently and has given us His Holy Spirit to empower us to do it. QUESTION The adversary, Satan, was real enough to Jesus – in the wilderness and wherever He found people oppressed by sickness or other difficulty. Have I become too rational and educated to look for these spiritual realities, and tackle them as Jesus did? PRAYER Lord, as I draw near to You in this season of preparation, I recognise that preparation involves change, and You are asking all of us to be prepared to check our thoughts, consider our priorities, review our responses – and give them all to You! Help me to let go of all that hinders, so I can grasp with both hands all You have for me that is lifegiving. In Jesus’ name and for His glory, Amen. 2 Surely God is my salvation; I will trust and not be afraid. make known among the nations what He has done, and proclaim that His name is exalted. 5 ‘Sing to the Lord, for He has done glorious things; let this be known to all the world. Change! The Righteous Lord is coming. 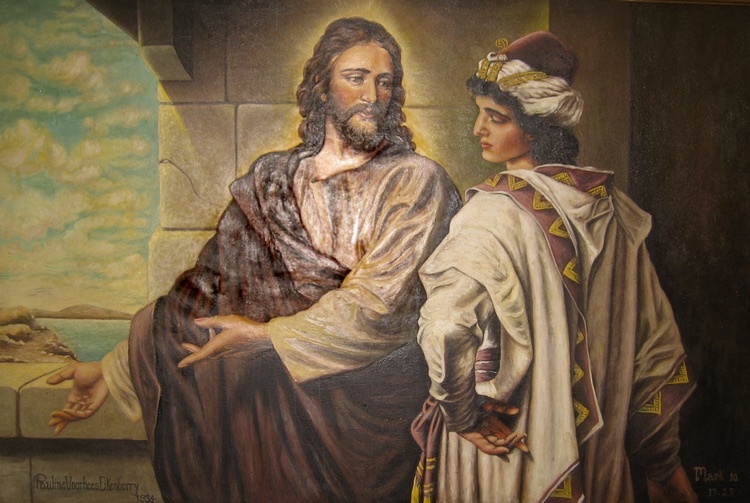 Jesus gently challenges the rich young ruler, to tease out where his security and his heart really is, Mark 10:17. Theme: How much have we caught God’s heart, and He ours? Job 23:1-9, 16-17 — Job’s heart is tested under oppression. A righteous man is blamed by his counsellors, but still holds out for God’s justice. Mark 10:17-31 — Jesus tests the heart of a wealthy follower. Mark’s story of the rich young man who had ticked the boxes for observance, but overlooked the priority of love. Eliphaz, in the previous speech, has treated Job as a sinner, in the darkness of sin and for whom he has a remedy. Zophar, the the speech before that, went further in aligning Job’s grave difficulties with his rebellion before God. There is some truth in both positions, but Job does not accept either of them: he humbly asserts that they do not apply. Job is an interesting exception to the general assumption, that everyone’s need can be met by preaching the gospel. 1-3 Then Job replied: “Even today my complaint is bitter; His hand is heavy in spite of my groaning. 3 If only I knew where to find Him; if only I could go to His dwelling! “If only I knew where…” – Job, true to his name (‘iyyob, Where is the heavenly Father? ), is trying to find God from his sense of abandonment. Eliphaz had instructed Job “Return to the Almighty” but Job (vv. 8-9 below) cannot find God to encounter Him anywhere. 4 I would state my case before Him and fill my mouth with arguments. 5 I would find out what He would answer me, and consider what He would say to me. 6 Would He vigorously oppose me? No, He would not press charges against me. “Would He… oppose Me?” – Job’s change of heart, expecting to find justice, Psalm 97:2 having worked through his earlier fear that God would be too powerful for him to be heard, Job 9:14-20, 33-34. 7 There the upright can establish their innocence before Him, and there I would be delivered forever from my judge. “I would be delivered” – Job is confident, as a God-fearing worshipper, of a fair hearing, leading to acquittal. The gospel is here in this passage, which looks forward to the justification to be found, not in the tally of our good deeds, but through the relationship we have with Jesus Christ alone, Romans 4:25-5:1; 8:1. 8 “But if I go to the east, He is not there; if I go to the west, I do not find Him. 9 When He is at work in the north, I do not see Him; when He turns to the south, I catch no glimpse of Him. 16 God has made my heart faint; the Almighty has terrified me. 17 Yet I am not silenced by the darkness, by the thick darkness that covers my face. “Made my heart faint” – Job’s affliction was physical (sores and wasting) but also what we categorise as mental illness. The devil’s oppression is a combined attack on (human) spirit, (thinking, feeling) soul — and (physical) body. “Thick darkness” – Job was fearful and anxious, feeling like he was groping in darkness, familiar to anyone battling depression. IN PRACTICE Despite physical illness and mental torture, Job’s heart is proving to be true. Far from blaming God for his misfortune, the devil’s scheme, He is trusting God for his deliverance. He feels sure that if he could have that conversation, that hearing, that He would find that God was for him. God is for us. It will always be the devil’s strategy to sow thoughts in our minds that God is for others, but not us; that we have done (or not done) something that exposes us to judgment and keeps us out of favour. This is the folly of the religious mind. The spiritual person, who knows God personally through Jesus, will know that it is our heart, and the relationship with God that guards our heart, that gives us assurance – and ultimately deliverance. QUESTION Why would God allow such a good person as Job to go through this trial of sickness and a feeling of “thick darkness”? How does Job’s faith, even while questioning, help us? “A man ran up” – previously in Mark’s story Jesus encountered small children who had no standing and were completely dependent. By contrast this was a young man, probably a member of a council or court, Luke 18:18, Matt. 19:20, commandment-keeping and rich. Jews of that time would consider him (wrongly!) to have a great standing with God and therefore claim to salvation. “What must I do” – the question of a religious, but not spiritual, person. He showed respect to Jesus (“fell on his knees”) but simply didn’t understand Jesus’ teaching of how the kingdom of God is entered, Mark 10:13-16. 18 “Why do you call me good?” Jesus answered. “No one is good – except God alone. “Why do you call Me good” – Jesus is not denying His goodness, but making the man think about his question and focus on God. Will he recognise the goodness of God incarnated in Jesus? Will he recognise that only God Himself is intrinsically good? “You know the commandments” – Jesus mentions the six that address wrong actions and attitudes to others including “fraud” for covetousness. “All these I have kept” – this doesn’t read well to us. But the man is sincere. For him, the law is about conforming to the doing, the externals (like the six commandments Jesus quoted). Jesus makes him think: what is missing? The requirement to have a good heart, to love God and, by extension, have God’s love for others, Mark 12:29-30; Exodus 20:3; Deut. 6:5. Entering the kingdom of God is always a step of repentance, Mark 1:5; 6:12. “Sell everything… give to the poor” – not a general command, but addressing the stronghold of self-sufficiency that was holding this man back from salvation. 22 At this the man’s face fell. He went away sad, because he had great wealth. “Camel…through the eye of a needle” – the largest animal and the smallest opening. The idea of a laden pack animal shedding its baggage to be led through a narrow postern gate is a great illustration that may (or may not) have been in Jesus’ mind. “Amazed…Who then can be…” – Jesus has overturned the generally accepted idea that riches are a sign of favour from God. “Who then… with man this is impossible” — this man, they would have thought, was an outstanding candidate. Jesus explains that there is nothing we can achieve of ourselves to gain salvation. It comes only by relationship with God and receiving His gift. 29-30 “Truly I tell you,” Jesus replied, “no one who has left home or brothers or sisters or mother or father or children or fields for me and the gospel will fail to receive a hundred times as much in this present age: homes, brothers, sisters, mothers, children and fields—along with persecutions – and in the age to come eternal life. “Left… for me… will receive…” — followers of Jesus share a family generosity that transcends social and geographical borders. In this context, the hospitality if a hundred homes and families sharing the same values. “First… last and… last first” — the kingdom order up-ends the accepted order of wealth, privilege and the merit of having kept the externals. The kingdom is experienced by disciples with no other claim than looking to Jesus and accepting the challenges of His humble way. IN PRACTICE This favourite story, also told by Matthew and Luke, goes right to the heart of our walk with God. Here was a man who had done all the right things that the law said were to be done, but how he felt about God was still a bridge to be crossed. Throughout history, man has put the first commandment – to love God with all our heart – on a shelf while working at all the others. The intention was to be so captivated by God and broken by His love, that everything else follows as a consequence. The rich young man had a theology of ‘doing’ – we might call it religiosity – but who had his heart? QUESTION Jesus asks us the same question from time to time: where is our heart? Can we do no other but to follow Him wholeheartedly, or is our human desire for self-sufficiency holding us? 12 For the word of God is alive and active. Sharper than any double-edged sword, it penetrates even to dividing soul and spirit, joints and marrow; it judges the thoughts and attitudes of the heart. “The word of God penetrates” – a warning to those living a sham that faithless disobedience will be exposed by the living power of the word of God which acts like an all-seeing eye. “Soul and spirit” – the human spirit together with the thinking, feeling, wilful soul. Taken together to mean the whole inner person. 13 Nothing in all creation is hidden from God’s sight. Everything is uncovered and laid bare before the eyes of Him to whom we must give account. “Everything… laid bare” – The word of God (v.12) is speaking and acting as the judgment of God Himself. All our thoughts and intentions are exposed, and accountable to the living, written Word, John 6:63, 68, Acts 7:38 as to the living God who is the author. 14-15 Therefore, since we have a great high priest who has ascended into heaven, Jesus the Son of God, let us hold firmly to the faith we profess. For we do not have a high priest who is unable to empathise with our weaknesses, but we have one who has been tempted in every way, just as we are – yet he did not sin. “Great high priest” – for Jewish Christians, coming out of the Old Covenant priest and sacrifice tradition, knowing Jesus as the Great High Priest of the complete, final sacrifice was an important faith connection. 16 Let us then approach God’s throne of grace with confidence, so that we may receive mercy and find grace to help us in our time of need. “Confident… that we… receive mercy and grace” — because this high priest has the unique qualification of having been tested through suffering and death for us, Hebrews 2:9-10. IN PRACTICE The ‘quiet time’ of starting the day with God and the Bible, letting Him speak through His word, has deep roots in Christian tradition. Fashions change in discipleship, as everything else, but in a busy and confusing world, the need for this discipline seems to gain renewed emphasis. The ‘down side‘, if there can be a disadvantage to learning to hear God speak to us, is that His word is truth. It is that sharp penetrating sword that exposes our heart. It is, very helpfully, a lamp to our feet and our path but also a bright light over the mirror that shows all our blemishes – the part we don’t much like. However, God, in His love, is not so much about showing up what is in our heart, as revealing to us what in our heart we still need to let Him purify. He is in the business of redeeming and recreating and regenerating, and in Jesus a ‘new heart for old’ is His ongoing promise. QUESTION The devil will always find ways to try to prevent you having a quiet time in the word. How resolved are you not to be put off meeting with God in this way?